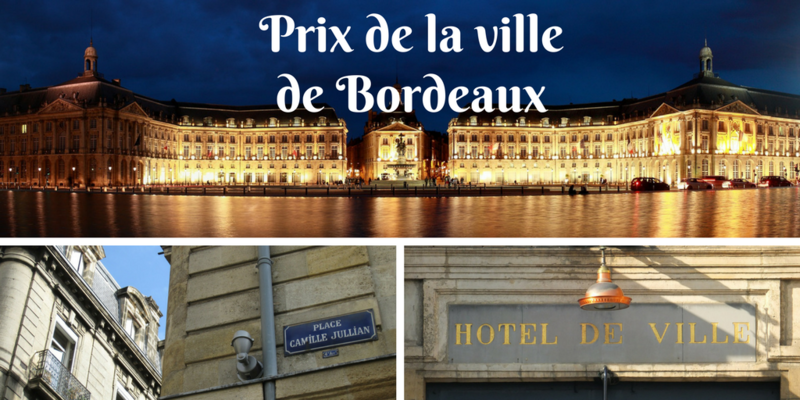 La Prix de la Ville de Bordeaux ?? Go for it ! I applied 2 years in a row and was very lucky to receive it the second year. I arrived in the rain, and although it took quite a few days for the sun to come out – very unusual I was repeatedly told – when it did it was hot. L’immersion totale started at the airport in finding where the bus went from and continued with a conversation with the friendly woman bus driver. It was then french all the time, even with the other students who had come from many different countries. I found the Bordelais generally very friendly and willing to accommodate someone trying to learn la belle langue, and I had many conversations with a wide range of people, from those in shops and cafes and museums and churches to those waiting in bus queues. The morning classes from 9 to 1 at the Alliance Building ( 3 floors, proper reception, lots of people doing lots of classes) were full on and busy and we often had quite a bit of homework to do in the evening. I say in the evening, because every afternoon there were very interesting culturel visits and outings that you could sign up for – some paying, mostly free – and I took full opportunity of these. 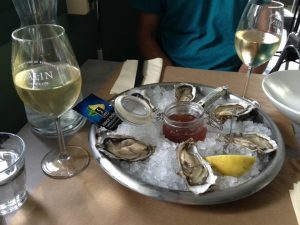 The city tour is a must – I did it twice with different guides; I paid for the visit to St Emilion and a chateau for une degustation, well well worth it; and I also visited a fromagerie, a chocolaterie, Le Corbusier’s worker’s village, to name just a few. In fact, for me, these culturel afternoons were perhaps the best part of the whole 2 weeks; visits to interesting places ( including being obliged to taste wine, cheese and chocolate – pas mal!) with local guides, intereacting with these and the people at the places, all in 100% proper french ( that’s theirs, not mine!) was really enjoyable and really affirmative. I also managed to fit in visits on my own to Le Musée du vin ( the old one), La Cité du vin ( the new one), Le Bar à Vin ( great place for a simple plate of cheese or meats and a huge selection of wine mostly at very reasonable prices – it’s a place of tutelage also); not to mention churches, beautiful squares and parks etcetera., etcetera.., and also on the Sunday to Arcachon on the coast ( oysters and white wine – yum!) and Le Dune du Pilat ( the highest sand dune in Europe). So, in my view an unmissable experience – apply for it , apply for it, and apply for it again – and then grab the opportunity with both hands ( and both feet!). I only wish I could go again!! What an amazing opportunity this was! Bordeaux is a very special city – a Unesco World Heritage Centre with more protected buildings than any other French city except Paris. It was fascinating to explore the historical centre, the lovely ambiance is helped by wonderful weather and the enlightened integrated transport policy which means a calm, ‘traffic-light’ centre. (The trams were the first in the world to run on solar power without overhead cables.) I used the city bikes to get around as they were easy and free, after a small registration fee. Apart from the well-known tourist attractions, I enjoyed the enormous public swimming pool in the centre which has the added benefit of a roof which opens on sunny days with sunloungers along one side! The Alliance Francaise building is located centrally and is well-organised and friendly. I loved being a student again for 2 weeks. The lessons were of good quality and the teachers were interesting. After a morning’s study, we headed off in groups for a local lunch where we put the world to rights, sharing views from so many different nationalities. There were some great discussions about Brexit! During the afternoon, we could opt into workshops, talks, trips or films – some were free, and all were really interesting and great for additional language practice. With the other 2 Laureates, I was invited to the Mairie for a meeting and tour with one of the Conseillers and his team which was an interesting insight into the views of some of the people running the city of Bordeaux. I was particularly impressed by how ‘outward-looking’ and international they were in their approach. My host for the fortnight was a lady with a love of cooking which was rather lucky as I have a love of eating! Her 4 children have grown up and left home so there were plenty of spare bedrooms. There were a total of 5 students staying with her from different countries so another opportunity to chat in French, sharing different perspectives on all sorts of things. The whole experience was a fantastic ‘bain linguistique’ which I would thoroughly recommend to anyone who can spare the 2 weeks. A big thank you to AF and the Bordeaux Mairie for such a wonderful experience. I left Bristol in a grey cold June of 15C, to arrive in Bordeaux in a heat wave of over 34C just over an hour later. I was met by Mireille at the airport who was glowing from a day spent at the beach. Despite taking off some layers, I still felt very hot and overdressed, however I was quickly made to feel at ease, and was driven at speed to the apartment. The next morning Mireille, my host, walked me to the tram stop and showed me which ticket to buy from the machine. I was impressed by how inexpensive the travel was in comparison to Bristol, and how regular and frequent the trams were. This welcome regularity during daylight hours however soon proved to be unwelcome during the night as the trams continued until after midnight and started again at 5am waking me several times during the night and I started to feel very tired and my concentration in class dipped. The school were very proactive and took the decision to move me. I moved to a different family for my second week – an ‘Avocat’ with four children who lived within walking distance of the school in a very quiet area. I arrived to find a vibrant and happy family with the sound of children’s voices emanating from different areas of the house. I was shown to an ensuite room in the attic, and found myself living alongside two other French students and Grandma, who took me under her wing. There was a small kitchen in the attic, and Grandma and I would breakfast together every morning. In the evenings I ate downstairs with the family. My two cultural experiences were very different and I have benefited from both in different ways. My first host although unused to having students was very interested to hear about my classes and cultural trips. We developed a humour between us and laughed over many things at meal times. My second family were more formal as both parents worked full time, and family life was centred round the four children and their activities. It was clear that Grandma was the core of the family and integral to its daily function. I was made welcome however and developed a friendship with Grandma, and found myself sewing on children’s name labels in preparation for the camps that the children were due to go on. I have come away with very happy memories and a recipe from Grandma, which I have since cooked successfully at home. I thoroughly enjoyed my French lessons every day at the school, and by the second week I began to feel that I was improving and could hardly remember any words in English which was a big surprise to me. The total immersion in French language, culture, food and way of life became the norm for me for a short two weeks and although nervous about giving a five minute presentation to the Minister at the Marie when we met on the last day I believe that I found the words to give justice to my experience and express my thanks for the opportunity. My wish would be that I could have extended my stay and become more proficient in the French language, as I met students from all parts of the world and made friends on the afternoon trips and excursions available through the school. The 150 euros ‘pocket money’ was appreciated and went some way to funding visits to St Emillion, Chateaux and wine tasting, the Corbusier village, a meal with Truffles in a specialist restaurant, and visits to the Chocolatières and Fromagère to name a few. I had a fabulous time in Bordeaux and thank the Alliance Francaise for selecting me to go as it rates as one of the best experiences of my life.